FARKEL® and THE ORIGINAL POCKET FARKEL A GAME OF GUTS AND LUCK® ARE TRADEMARKS OF LEGENDARY GAMES, INC. WICHITA, KS 67278 GAMEPLAY AND SCORING COMBINATIONS © COPYRIGHT 1998 – 2017 COPYRIGHT OFFICE OF THE UNITED STATES. TX0005735193. LEGENDARY GAMES, INC. WICHITA, KS 67278 ALL RIGHTS, ALL MEDIA RESERVED. A perfect educational game that not only utilizes math skills, but also exercises visual memory. Get this for your favorite young student today! With its easy to follow instructions and minimal pieces, Farkel is perfect for players ages 8 and up. Game night just got easier and more fun for everyone! Meet Charlie and Mary, just a couple of folks from Wichita, Kansas. Seventeen years ago they had an idea and a dream to sell a six die dice game to America. With no facilities, no marketing, no experience and no business plan this is where this story should have ended. But they build them tough in Wichita so with a few hand-cut point of purchase displays and a box full of dice games they hit the road in ‘Farkel 1’. For the next 16 years Charlie and Mary criss-cross America selling their six-dice Farkel game and building a brand. 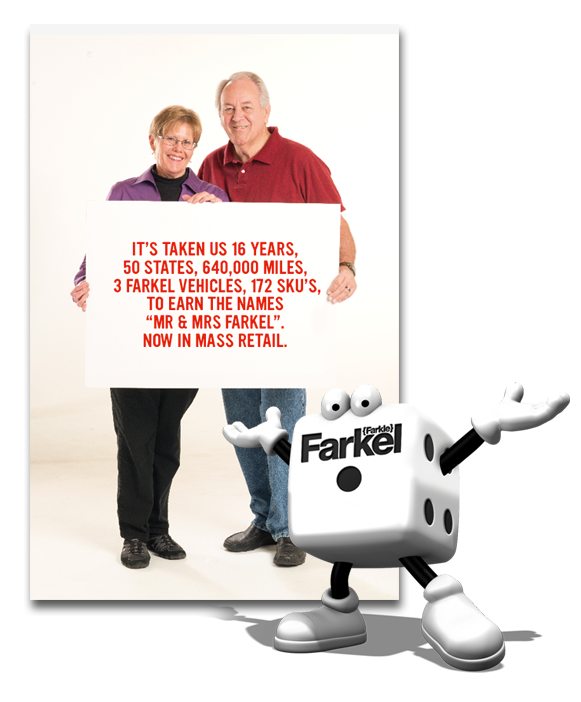 Today “Mr & Mrs Farkel” still continue to drive across America playing and selling their ever growing range of Farkel games (172SKUs and still counting!) whilst continuing their dream to sell the best little dice game in America. If there was ever a ‘Hall of Fame’ for Dice, these guys should be in it!